hotel features 124 SLS hotel rooms and suites, 450 SLS branded condo residences, and a collection of Sbe’s retail, spa and food and beverage concepts. With the collaboration of Sbe founder, Chairman and CEO Sam Nazarian, the Related Group’s founder and Chairman Jorge Perez, and, along with SLS’s creative partners Philippe Starck and Chef José Andrés, the SLS Brickell is an innovative and deluxe hotel, which attracts many who seek an extraordinary experience. 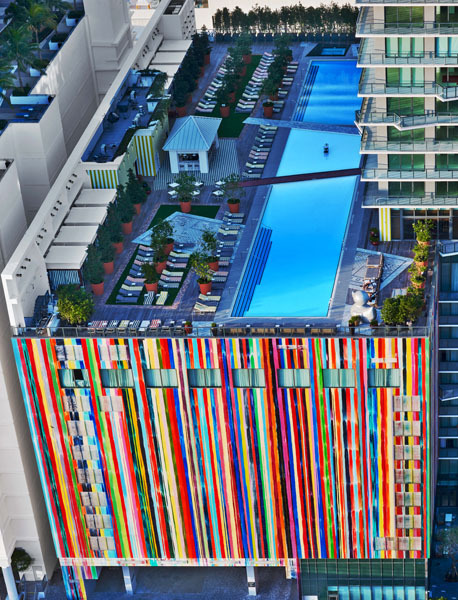 The SLS Brickell Hotel is the newest addition to the famous Miami skyline and for a good reason at that. Packed with elements of creativity and community, this oasis is unforgettable when considering luxury, style and service. 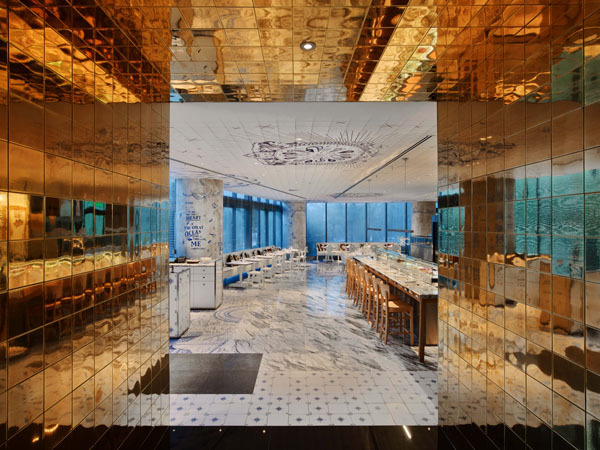 French designer Philippe Starck meticulously designed interior spaces, offering a piece of his soul in each space. The rooms are ingeniously designed to accommodate for space, but also style. The white drenched bathrooms are classically elevated with floor to ceiling mirrors surrounding the shower and bathtub. Each room is occupied by subtle artistic elements without over powering the sophistication that is apparent in the building. Beetle juice fans will be delighted to walk through the corridors of the hotel, as they lead by black and white striped walls. Other art influences include German artist Markus Linnenbrink, who painted wide ‘drippy’ mural, covering the buildings façade to add a pop of colour—it can’t be missed. Spanish artist Bernardi Roig created a striking sculpture that greets guests in the lobby of the establishment. In terms of functionality, this hotel has it all. 24-hour lifestyle amenities include concierge services, valet parking, in-room dining services, a state of the art fitness center, a BMW-7 series house car available for transport, private cabanas, alfresco dining and bar and a 200 foot-long heated pool and spa, just to name a few. 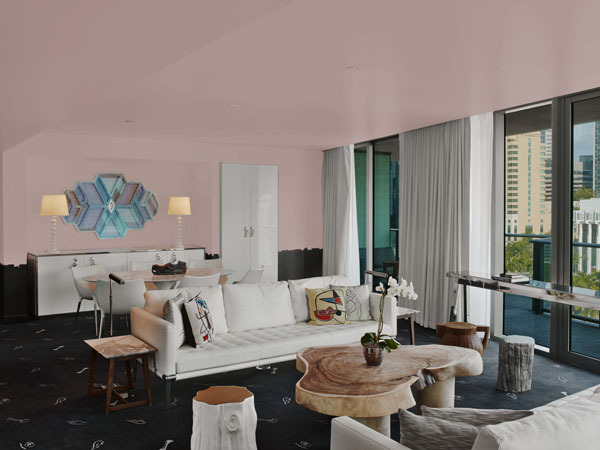 Guests will be pampered, and treated to all the perks of living in luxury, while sipping on a cocktail and revelling in a beautiful Miami sunset.